When we began our life on the road, we hoped to have time and opportunities for volunteer service. Last week we got our first chance, through an organization called the RV Disaster Corps (RVDC). What is the RV Disaster Corps? The RV Disaster Corps is a relatively new federally funded non-profit organization that serves communities affected by natural and man-made disasters. RVDC trains RVers and then connects them with volunteer opportunities in impacted areas. RVers are uniquely suited to help at disaster sites because they travel with their own housing. Their RVs enable them to relocate without consuming scarce local housing resources. As a Texas-based agency, most of the RV Disaster Corps’ current projects are in the state of Texas. They do plan to expand their operations nationwide. But Texas has plenty of disasters by itself–in fact, it leads the nation in the number of major disaster declarations (86) since 1953. Hurricanes, tornadoes, floods, industrial catastrophes…Texas has them all. Right now, RVDC is providing volunteers to agencies that are helping the Texas Coastal Bend recover from Hurricane Harvey. 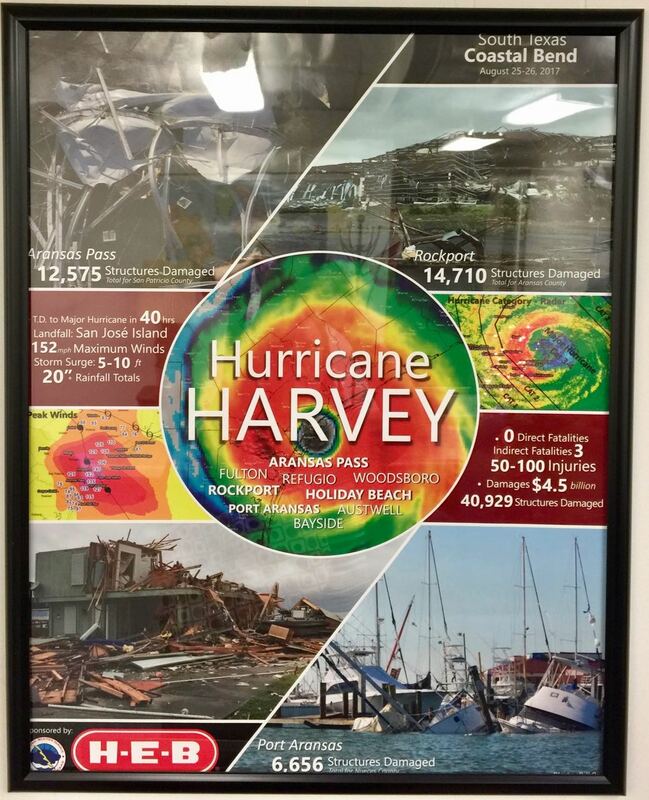 In August 2017, Harvey made landfall in the Rockport-Fulton/Port Aransas area, resulting in catastrophic devastation across six Texas counties. The storm exploded from a tropical depression to a major hurricane in a matter of hours, roaring ashore as a Category 4 monster with sustained 130 mph winds and gusts to 150 mph. 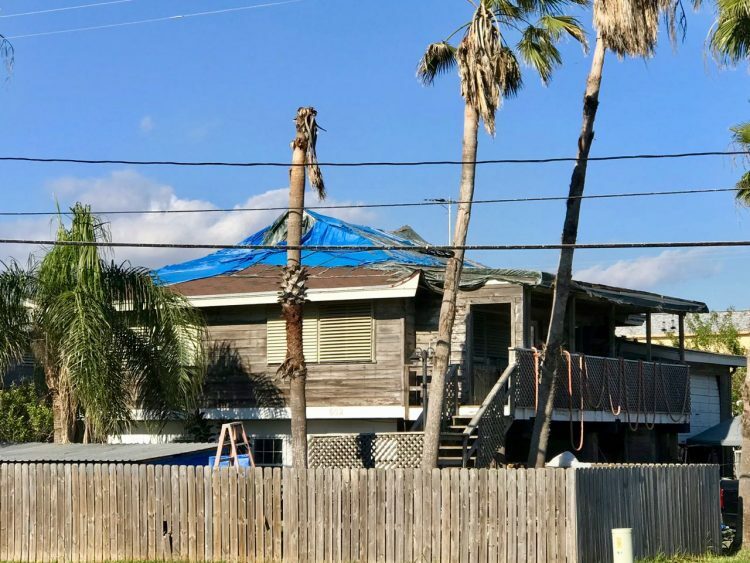 With little time to adequately prepare for the storm’s arrival, thousands of coastal homes and businesses were damaged or destroyed. Cheryl and I signed up with the RV Disaster Corps last spring after we learned about the organization at the Escapees Escapade national rally. We each completed a short online training course, and received our “Go Kit” containing bright yellow RVDC vests, name tags and other supplies. Later in the year, when we knew we’d be back in Texas for a while, we contacted RVDC and offered to volunteer for a week with the Hurricane Harvey recovery. 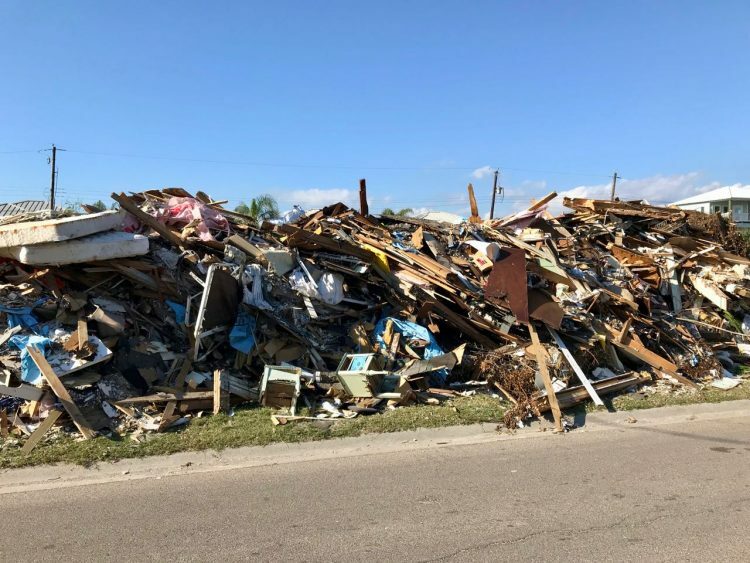 The RV Disaster Corps connected us with the Coastal Bend Disaster Recovery Group (CBDRG), a local state- and FEMA-recognized long-term recovery organization created to help low-income and socially vulnerable Coastal Bend residents affected by disasters. Soon after that, we had our volunteer assignments and reservations at an RV park in Rockport for December 15-22. (Although RVDC volunteers usually bear their own expenses, we were grateful that in this case CBDRG paid for our campground.) I had offered to work with a construction team, while Cheryl would be helping out in CBDRG’s office in Sinton. We were concerned that transportation might be tricky, since we have only one vehicle (our truck) but we would be working in two different locations. Fortunately, CBDRG’s bookkeeper, Debbie, offered to pick Cheryl up each morning on her way to the office in Sinton, about 40 minutes inland. The only downside was that Debbie leaves at 7:30 am! As you may know, Cheryl is definitely not a morning person, but with the help of a few cans of Diet Dr. Pepper, she was always ready on time. As a nonprofit, CBDRG is accountable for all the money it spends, and its records are audited at the beginning of each year. 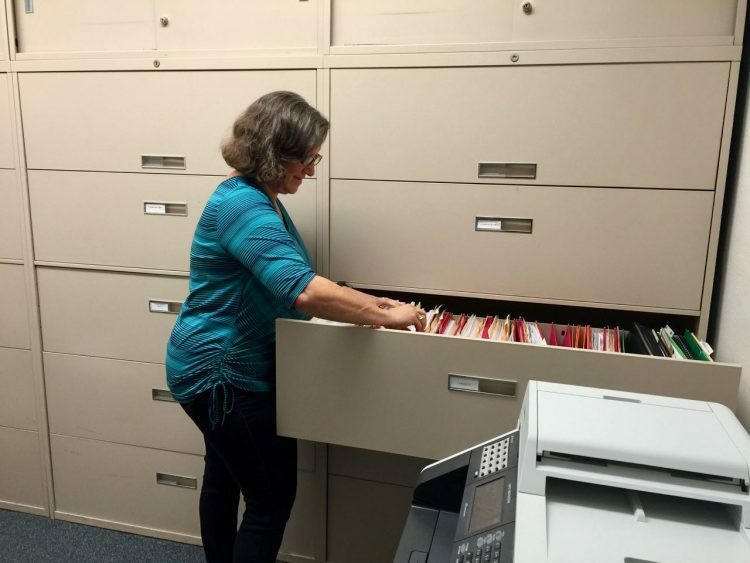 To help prepare for the audit, Cheryl reviewed each vendor’s file to ensure that every payment request was correctly substantiated, authorized and credited to the appropriate funding source. With thousands of bits of paperwork to maintain, the office staff was incredibly grateful for her help. The CBDRG office staff adopted Cheryl for the week, even including her in their holiday party and presenting her with a Christmas stocking (her first ever) full of goodies. My trip to work was probably more scenic than Cheryl’s. Each morning, I drove south to the small town of Aransas Pass, and then east on the Port Aransas Causeway to the ferry dock. 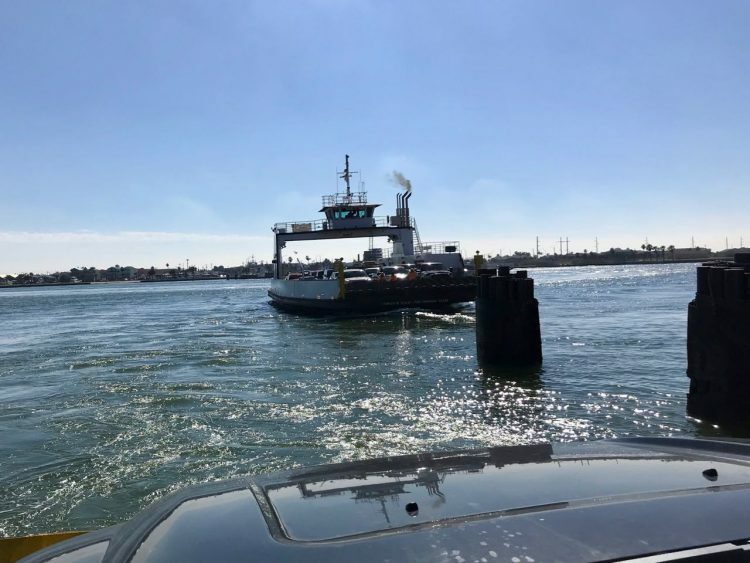 There, a fleet of ferries shuttles vehicles across the last quarter-mile of Aransas Bay to the beach town of Port Aransas. 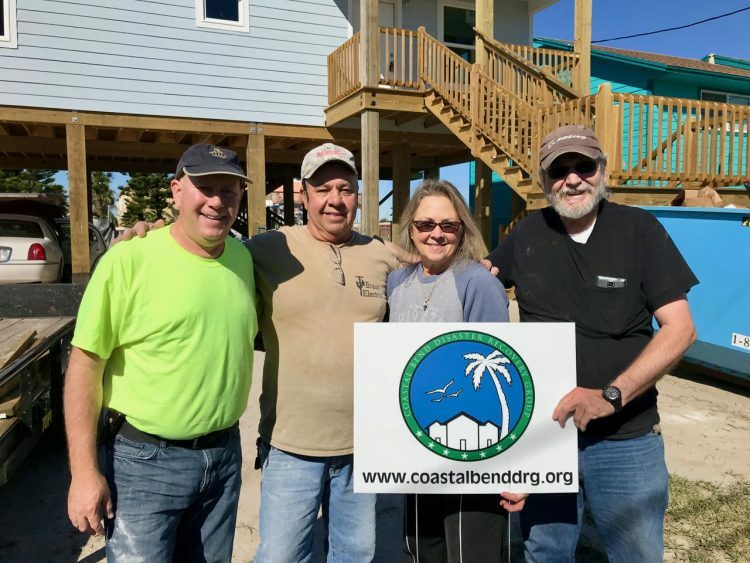 CBDRG had several rebuild projects going on in Port Aransas. Although I helped move materials to and from another house at the beginning and end of the week, I spent most of my time at one rebuild project. 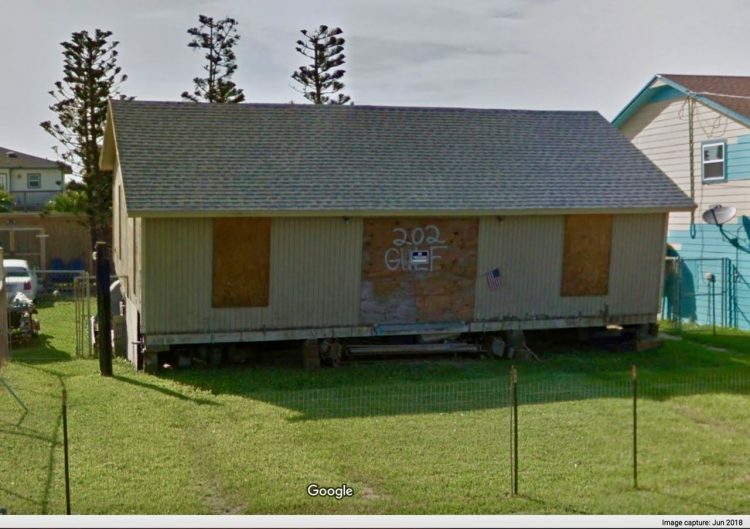 This is what the house there looked like in June 2018, still uninhabitable after the hurricane. Deeming the existing house too costly to repair, CBDRG demolished it. Then, starting early in the fall, volunteers and tradespeople built this cozy new two-bedroom, one-bath home in its place. 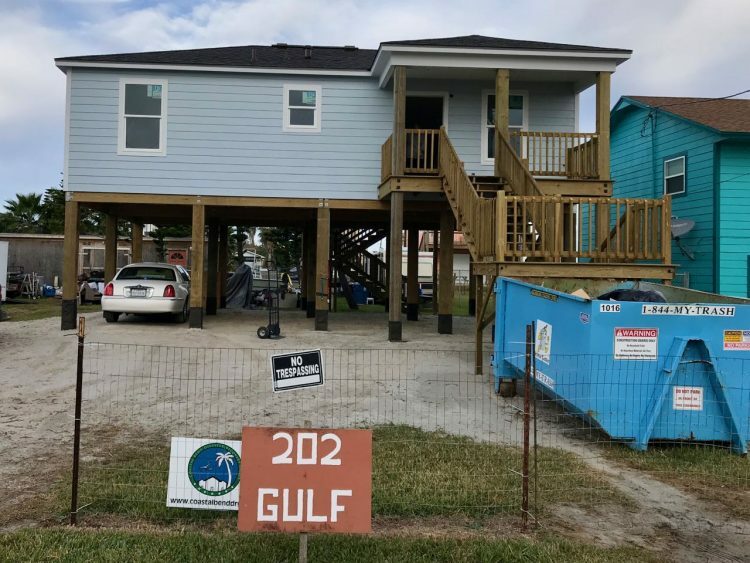 Like most other new construction in Port Aransas, the house is built on stilts to protect the living areas from flooding. Volunteers had just finished painting the interior and exterior of the house the previous week. 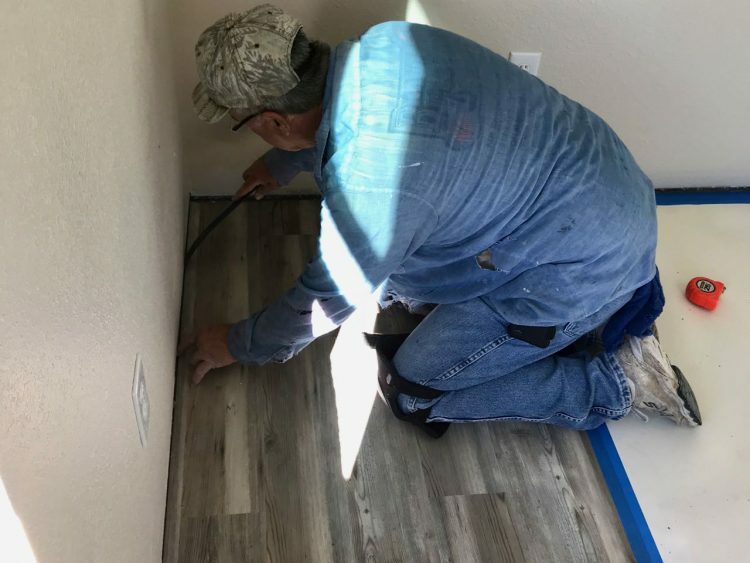 The next task was to install vinyl plank flooring throughout the home. I met CBDRG’s project manager Leann, two other RV Disaster Corps volunteers, Les and Denise, and the homeowner, Gene. Then we got to work. 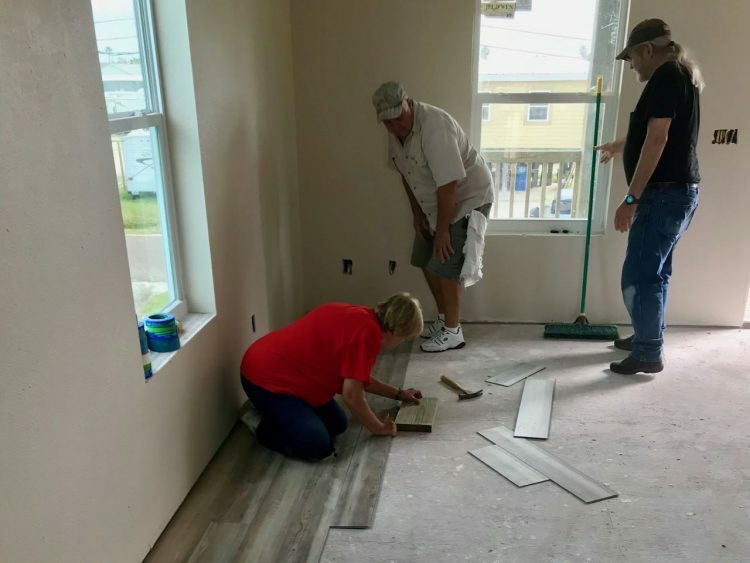 After we scraped, swept and vacuumed the subfloor, Leann showed us how to lay the click-lock floating flooring. Those planks never did seem to click into place as easily as the instructions said they would. We started out slow, but by the second morning, we had honed our technique, and began moving faster. That large, open living area went quickly…until we had to start cutting notches for perpendicular walls and door frames! We took care to ensure that we lined up the plank ends consistently throughout the house, even though that meant a lot of measuring and saw cuts (and more errors, like cutting the wrong edge of the planks, than we’d like to admit). No shortcuts here. Fortunately, CBDRG provided us with excellent power and hand tools–and most important of all, good knee pads! Our little crew soon got into a rhythm. As we completed each section of the floor, we covered it with paper for protection during the remainder of construction. 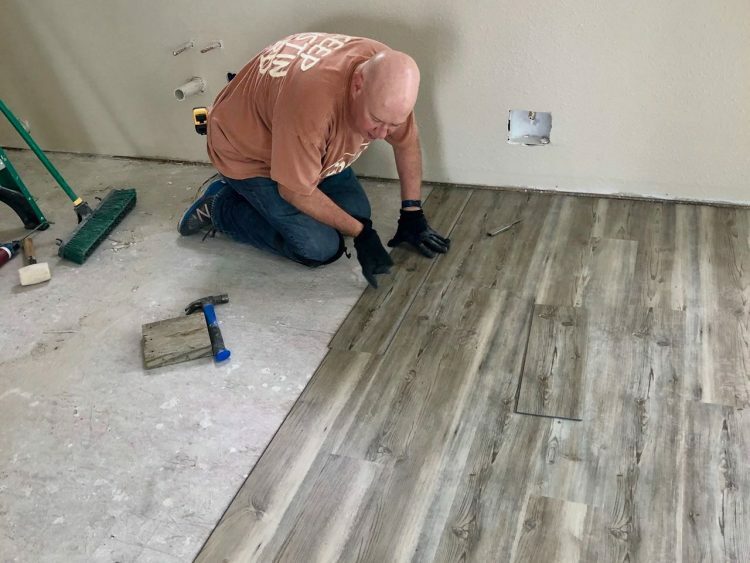 By Friday morning, we had Gene, the homeowner, ceremoniously install the last piece of flooring in the master bedroom. I won’t lie: we worked hard, and it was tiring. By mid-afternoon each day, our knees (and legs, and backs) were stiff and sore, and we made more mistakes. Leann kept an eye on us and made sure that we knocked off for the day before we overdid it. 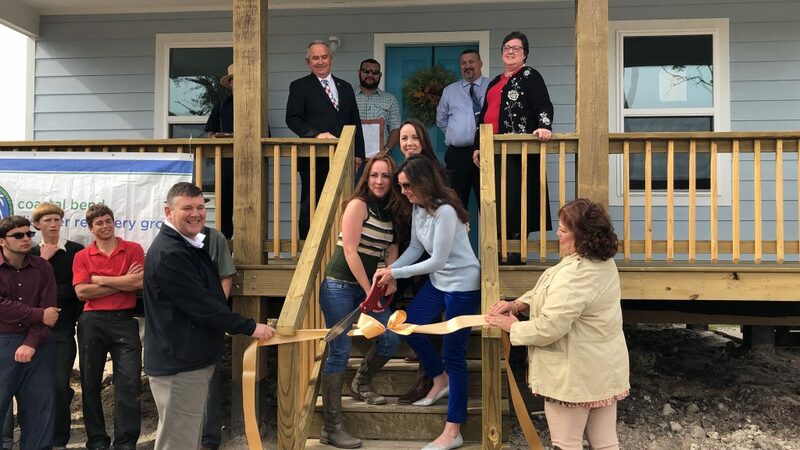 During our week of service, CBDRG presented two new, fully-furnished homes to residents of the Coastal Bend. Each presentation includes a ribbon-cutting ceremony covered by the local media. CBDRG has secured almost $4.8 million in funding to repair, replace or rebuild 165 homes damaged by Harvey. Almost half of those are in Aransas County. They have completed about a third of these projects, so there is much more still left to do. Their work will take another 18 to 24 months to finish–depending in part on how many volunteers offer to help. Our week of volunteer service through the RV Disaster Corps was a great experience. We are blessed to live the lifestyle that we do, and for that week we were able to share some of those blessings with others. RVDC needs more RVers to join its ranks. We encourage every full-time and part-time RVer to sign up, complete the online training course, and give a week or two–or more–of your time to those who need your help. Well done, Cheryl and David. What a rewarding experience. Thank you for sharing your insight. Thank you so much for volunteering in our area. This is a great story and may God continue to bless your journeys. Thank you for reading our post, Donna, and for all that you’re doing with the CBDRG! Donna – thank you for all you do for the CBDRG! Wonderful! I hope to someday volunteer with this group or one similar. Thanks for sharing your story! Julie, I’m glad you enjoyed it. I hope you will consider volunteering, either with RVDC or a similar organization. It’s a fulfilling and rewarding experience. CBDRG is grateful for every volunteer and every hour. The Texas Coast is rebuilding, and needy residents are being assisted with the help of many partners. Thank you for all you do for CBDRG Pastor Beth. It was a pleasure to meet you. The community is lucky to have you there. Your efforts are so very appreciated. As fellow RVers, we are inspired by this means of giving back. 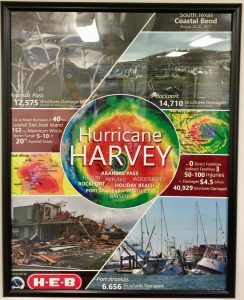 And as RVers with close family members who live in Port Aransas, we thank you and the RVDC for showing what it means to serve. Thanks Emily! 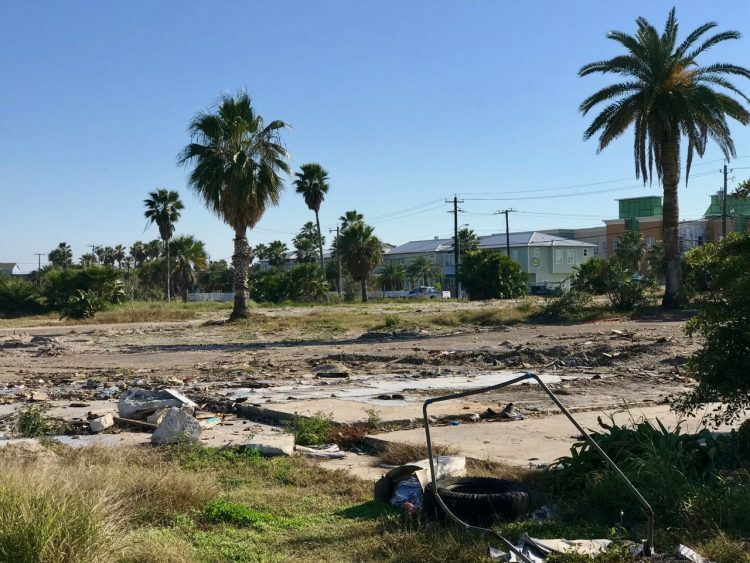 I didn’t know you had family in Port A. I was actually surprised at how well much of the area seems to have recovered. But there’s still a lot left to do. We are so thankful for your help last week. Cheryl was a joy to have in the office. She was a great help and and I am happy to call her a friend. Such kindness and wise advice. David was a great help in Port A. Enjoyed our dinner dinner out. Wished I had been able to get to know you better. Thank you, RVDC for sending the Goldsteins our way. Same here, Debbie – I enjoyed getting to know you and Terry, even though it was for a short time. Cheryl loved working with you and the others in the office. Thank you for all you both are doing on the coast. Hope we’ll see down the road someday! Debbie – thank you for being my driver and my new friend. Wishing you the best of everything as you and Terry continue to give back to communities that need your talents. Please keep in touch. We participated too and not only appreciate the experience but also your excellent blog which mirrors our trip quite well. I would love to share with my friends as well if you don’t mind! Thanks for the kind words, Carrie. You are welcome to share the post with anyone you’d like to. The more awareness we can bring to RVDC, the better! What a great experience! That’s awesome! Looks like a great way to volunteer. We will look to sign up soon.